Newly Renovated March 2019 Pictures to come. Luxury Executive 1 Bedroom 1 Bathroom located at 1800 Atlantic. It is a Penthouse Unit that has been completely renovated. New kitchen features Samsung Show Case" Fridge and slide in range, Bosch ultra quite dishwasher. New flooring, new interior doors, base boards and trim, Ship lap accent walls and new paint colors. New Murphy bed and mattress. This 1 bedroom condo is considered to be very large by Key West Standards. Vaulted ceilings in both living area and bedroom, 2 sets of Patio Doors opening on to the Balcony that provides a peek of the ocean, King Size Bed and a Queen Size Murphy Bed, Large well equipped Kitchen fully renovated March 2019.. Our bathroom was completely remodeled in Sept 2016 featuring a "Couples walk in shower" (the shower heads both operate at the same time or individually.) This Condo offers a laid back Cottage Decor with Central A/C, high quality Bedding and Linens. Stainless Steel appliances include, Fridge,(with ice maker) Stove, Microwave and Range Hood, Whisper Quiet Dish Washer, . The condo is also equipped with a Full size Washer and Dryer, 55" Smart TV with sound bar, 50" Flat screen, HD Cable, Secure wireless internet, local and long distance telephone for continental USA and Canada.... We include the use of 2 Adult bicycles (The Best Way to Explore our little Island) and unassigned off street parking for 1 vehicle! The use of the pool, whirl pool, sauna, private natural beach area, picnic/grilling area, tennis courts etc. The grounds are beautiful with lots of little surprises, here you will see that Orchids do grow on trees! This is our little piece of Paradise! We are Canadians and We LOVE to travel and have visited many different places over the past 12 years since we met..... Cuba, New Zealand, Korea, Spain, Germany, Holland, Ecuador, Scotland, Australia, many trips to the US, Florida, California, and Maine, and a 45 night road trip to Alaska and back. We have also visited a number of places in our own country, Vancouver, Toronto, Niagara Falls, Montreal, Quebec City, PEI, Newfoundland, etc. It is always our preference to stay in a privately owned condo or cottage when the opportunity is available. We enjoy being able to have our coffee in the morning, having a fridge on hand for beverages and snacks and most importantly a comfortable spot to relax at the end of each day! I have been traveling to KW for 30 + years. When we had an opportunity to view this condo we fell in LOVE! The large spacious layout is perfect for our extended stays. Being located on the Atlantic side of the island this is one of my favorite places to ride my bike with the wide bicycle paths that skirt the beach and the Atlantic Ocean. It is very relaxing and less congested than Old Town, the grounds are beautiful and we very much enjoy the pool, whirl pool and natural beach area... this is our happy place. Completely renovated! Our home offers high end finishes, a gourmet chef's kitchen, spa like bathroom. 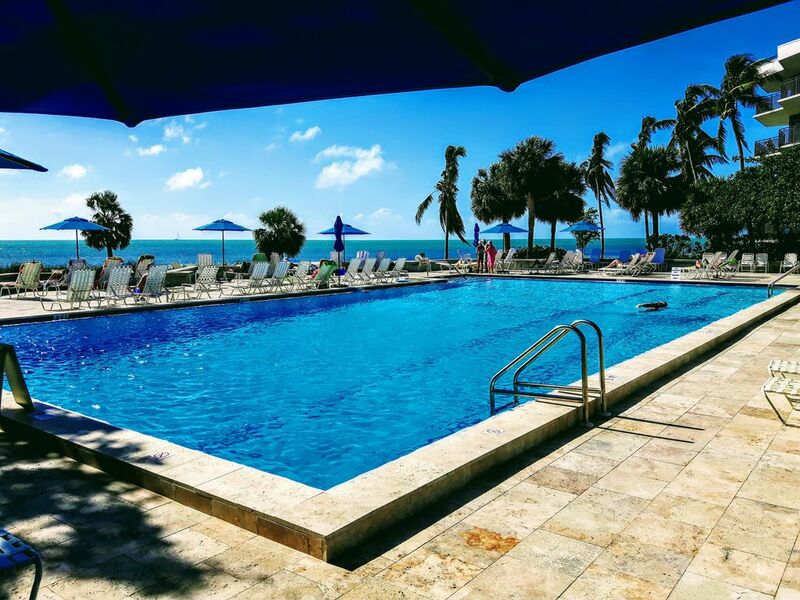 High quality linens, memory foam mattresses, the grounds are absolutely beautiful, the Olympic sized pool, whirl pool, private natural beach area and sauna are all highlights and if you want to 'play' at the beach Smathers Beach is just around the corner and offers you many options. We include the use of 2 Adult Bikes, so you can see and feel the island like a local. You are never far from anywhere or anything. We prefer to use the bikes as our main mode of transportation when in Key West it is the slower pace that allows you to truly relax and take in all of the little wonders..... and there are no parking hassles. Full Bathroom with large vanity and couples shower. Remodeled September 2017. Includes quality towels, face cloths, liquid hand soap, 1 bar of body soap, hair dryer. **The main light fixture is on a dimmer for late night visits! This complex has its own private natural beach area but if you want the excitement of the Public Beach Smather's is just around the corner.... You don't even have to cross the street!!! A comfortable stroll or bike ride to Old Town.... remember the island is only 1 1/2 miles wide and 4 1/2 miles long!!! You are never far from anything! We are considered to be Midtown. We are one of the few private condo complexes in Key West that boast a private natural beach! This complex is much like a resort with gym, tennis, whirl pool, sauna, pool, private natural beach, and wonderful grounds. However you cater. Key West is only 1 1/2 miles wide and 4 miles long you are never far from anything! Ocean peek from the Balcony full open view from the pool and courtyard. Maytg Full size washer and dryer with sanitize setting. Access with security card that is provided This is were the bikes are secured. But you must park outside in unassigned parking spots provided. Oversized Turkish Bath towels can be use after the shower or fresh ones supplied for the pool and beach. There are also plush traditional terry towels provided as well. Retro style sofa and 2 cool chairs made from reclaimed red wine barrels, 57' Smart TV with sound bar, coordinating accent cushions and colorful carpet. Stainless steel with Ice Machine!!!!!!! Kurig Cappuccino/Latte maker with frother or Mr Coffee drip with stainless steel carfe. Stainless steel 2 Slice with Bagel setting. Salt, pepper, a few mixed spices. High quality, matching plates, glasses, eating utensils, wine glasses, etc. Completely renovated high end kitchen. Vetrazzo recycled glass counter tops, shaker cabinets, Kurig Cappuccino/Latte maker, Ninja blender everything you will need. 2 Samsung Smart TV's 55" with sound bar and wireless woofer in Living area, 50" with voice activated remote in Bedroom. Small Shelf Stereo, with CD, IPod adapter, and smart phone compatible. Onsite common area library available for your use. The grounds are very well manicured and maintained. Lots of lovely tropical plants. Sliding hurricane glass patio doors from both the living area and the bedroom. (New Feb 2013) With 2 big comfy chairs to relax in and a small bistro set for 2. Sea Kayak rentals are widely available in Key West Area but we do not supply. The use of our personal bikes, one mens and one womens bike...... sorry we don't supply helmets and you should bring extra lights for night riding. Boat rentals are widely available in the Key West Area but we do not supply. Located around the pool and whirl pool, with open views to the ocean and surrounded by beautiful floral and fauna. 1 Clay Court and 2 Regular Courts (Lite at night) I have been told that this is the nicest clay court in Key West. There is wheelchair access however the unit is not equipped with hand rails etc in the bathroom or shower area. Sauna's are located in the bathroom in the pool area. Olympic sized pool that over looks the private natural beach area and the ocean. The Common Area is nestled in the center of the complex boasting 400 feet of ocean frontage, an Olympic Sized Pool that is complimented by the Whirl Pool. The Sunning Deck that surrounds the pool area also has a Grilling area (you will have to supply your own brickets) with picnic tables that offer both sun and shade. There are designated smoking areas, Library and even fresh potted herbs for the chiefs delight. Lit Clay Tennis Court (one of the most coveted tennis courts in Key West) plus 2 additional Tennis Courts that are also lit. The use of 2 Adult Bikes, Secure wireless internet and telephone offering free long distance (in continental USA and Canada) Unassigned off Street Parking..... 2 TV's, HD Cable, Blender etc. We continue to upgrade and enhance our vacation home on a regular basis, adding personal touches bringing in the Beach House Cottage style. We have dimmer switches in every room to help set the mood, mutipul battery operated candles, etc. Welcome to the Beach! Check in was breeze. Room was very comfortable. Do agree with previous occupants; need earplugs to sleep. Always a breeze. Very secure. We walked to Duval street everyday. Glad that you enjoyed your stay.... we are in the midst of major renovations right now and I have done some research on white noise machines. I personally don't find it difficult to sleep when I am here and we live in a tiny fishing community on a dead end street....... when we aren't here..... with no windows facing the road...... this is a very small island..... there is traffic. We enjoyed being in Key West again. The condo is certainly adequate for a couple for a week or two. Nice balcony for morning coffee while watching sun rise. Modern shower which we enjoyed. We did not use the Murphy bed. Washer and dryer in condo were handy. Kitchen was well appointed; large refrigerator/freezer. Large screen TV was nice for watching football playoff games. Appreciated the attention of the property management to security. Beautiful courtyard and pool area. We had no difficulty finding lounge chairs. Noise level around the pool and extensive courtyard deck was tolerable. Also, had no trouble finding a parking spot for our car across the driveway of the condo buildings beside the tennis courts; we drove down. The one downside for the condo which must be mentioned is the noise from the traffic on Bertha Street, which is a major cross town artery, running parallel to the A-building. Quite annoying a times; especially in the late evening and early morning. May not be an issue for people from a city environment. The condo is well appointed, the bikes are great. However the condo is on a very busy street so it is extremely noisy and the diesel exhaust from the motorcycles, mopeds, trucks, buses etc. make it up to the 4th floor. must keep patio doors closed. You will need a white noise machine & earplugs to sleep. The balcony only gets morning sun, however courtyard/pool area is nice. Thank you for your review. I am sorry that you were disappointed with your stay. I agree that the condo over looks the street however I think that the "Very Noisy" assessment is subjective. We live in a rural fishing community in Nova Scotia but we don't have any issues with the sounds of life when we stay here at 1800 Atlantic. The patio doors and transoms were replaced with Hurricane rated glass in 2014 (they block a significant amount of sound) There are heavy luxurious curtains in the bedroom to add additional ambiance and make the bedroom a serene retreat. I will certainly look into a white noise machine or a "sound machine" however I find those sorts of things to be more annoying than the sounds of life but that is subjective on my part. We have never had an issue with exhaust smells on the balcony and have found that the foliage between us and the street have provided a pretty good buffer for sounds etc. It is important to remember that the island is small, it is not a deserted Island.... . However if you think that a white noise machine would be helpful I will certainly invest in one for future guests. Wishing you safe travels where ever life may take you. Ok hear is my rating. Property 8, looses points for the gym. Condo 8, not much a view. Great kitchen layout. Decor 9, very interesting decorations. Location 4, IF you are looking to get away and not spend a great deal of time on Duval this is perfect. A rental car is nice to have but parking in Old Town is a pain. Lyft and Uber will be handy then. BIKES 10, it was awesome having them, we rode 4 of our mornings there. I am able to navigate the island pretty well from memory. The early rides are a must do and the bikes are very capable of getting you around, be aware though, others do not pay attention to their surroundings. Enjoy this place and the island!! Thank you for taking the time to give us a review. I am little surprised and disappointed by your 4 star rating. You didn't make mention of the absolutely stunning gardens in the courtyard that boast over 850 orchids on the property, a massive swimming pool with a spectacular ocean view, and a relaxing hot tub with ocean views as well. You deducted 2 points for the gym., the equipment in the gym is high end and it is only about 18 months old. Unless you are staying in a resort hotel on the island it is very unlikely that you will have access to any type of gym. We personally contributed $2000.00 to the project and think it is a great asset to the property not a detraction. Condo 8 I try very hard to make sure that potential guests aren't expecting an ocean view and have a picture of our little peek of the water on the site. We are a penthouse unit (4th floor..5th above ground level). and that is just about as high as the buildings in Key West get except the LaConcha Hotel at 7 stories there is a peek of the ocean but not much more however, we find that all of the palm trees and other tropical plantings make us smile when we are there. Location 4, You are correct we are not on Duval however we are located next door to the largest and most popular public beach in Key West, Smathers Beach and we are less than 15 minutes to anything/anywhere on the island by bicycle, which is my preferred way to get around the island. I feel that your rating on location is shall we say a little harsh because of the size of the island 1 1/2 miles wide and 4 1/2 miles long you are never far from anything when you are in Key West. The bikes are certainly the best way to get around when you are in Key West as parking is sometimes difficult in Old Town and it can be expensive as well. You are correct, it is very important to be aware of your surroundings at all times because when folks are on vacation they tend to be easily distracted when there are so many beautiful plants and critters that we aren't accustomed to if we live in colder parts of the world...... As I like to joke, who me ADD.... OH! look a chicken.... and there are a lot of beautiful chickens in Key West. Nice property with many amenities. Great location easy to get anywhere on the island. Check in was easy and parking always available. Adjacent to busy street so there is some street noise. Condo is well equipped with all you need. Sherri was very helpful with directions and suggestions. We enjoyed our stay! Thanks for the great review.... hurry back! Key West has it ALL!!!!!!!! This little island paradise is only 1 1/2 miles wide and 4 miles long. With that in mind you are never far from anything. Smathers Beach is just around the corner there you can partake in Wind Surfing, Snorkeling, Jet Skiing, Para Sailing, Sunning.... the list is endless! This area of Town offers up a number of excellent restaurants, a short Bike ride will get you to Duval St, Sunset and Buskers at Mallory Square, Fort Zachary Taylor State Park and Beach, Key West Eco-Discovery Center. If you want to spend the day at the Beach and the evening on Duval this is the perfect location! Rates are subject to change until reservation is confirmed. Credit card information to keep on file will be required prior to access instructions being sent. We do not collect a security or damage deposit but retain the right to charge any damages to the credit card on file. Please review our cancellation policy at www.attitudekeywest.com before booking.